Gord Downie in Montreal or Quebec City? Inform me about the next events for Gord Downie. Enroll yourself to our priority waiting list for Gord Downie to be alerted when new tickets are available. Filling this form doesn't engage you to any purchase. Gord Downie will be performing at Le National, in Montreal, on October 23rd, 2010. 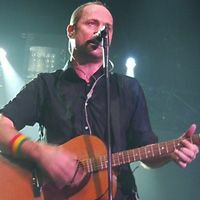 Leader of the famous Canadian band The Tragically Hip, Gord Downie (Gordon being his real first name) recently released his third solo album The Grand Bounce. For his Montreal concert, Gord Downie will be accompagnied by his backup band The Country of Miracles (which features Julie Doiron, Josh Finlayson from Skydiggers, as well as Dale Morningstar, Dave Clark and Dr. Johnny Pee from The Dinner is Ruined).